Push Your Luck Podcast: Guts of Glory! No guts, no glory! Guts of Glory! No guts, no glory! 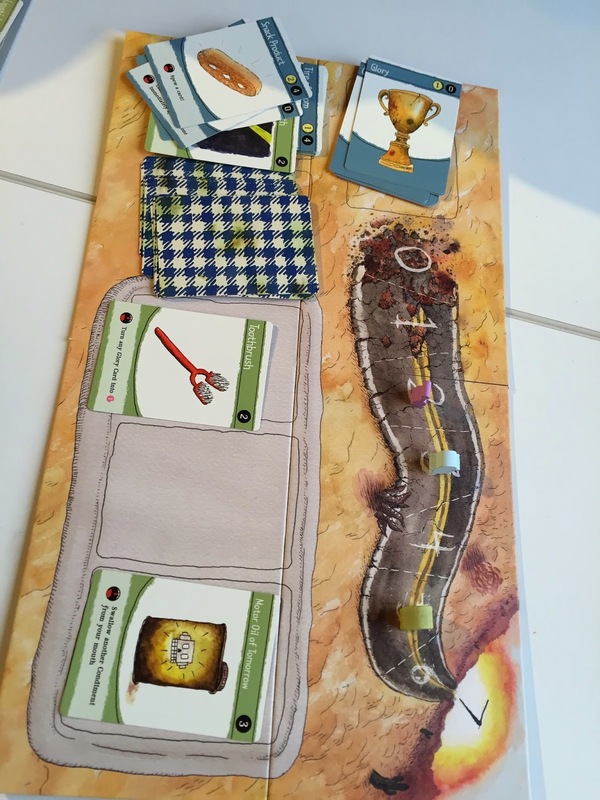 Guts of Glory was a 2012 release, funded via Kickstarter by designer Zach Gage who is probably more well known in the video game industry. It is a 2-4 player, light player tableau management game where players are creatures trying to chew and swallow 7 glory points worth of items. The first to do so will win the game. The theme is quirky and the cards are humorous and coupled with wonderful looking art makes this quite an interesting game to seek out and try. During your turn, you must take a card from a market of 3 revealed card and then try to put it into your "mouth" which is represented by a player board in front of you. If its a condiment card, then you must put it into one of three slots in the middle of your mouth. If its a item, then it can be placed in either of the slots at the end. If the slots are full, then you trigger a spew action where you attach a 1 Glory card to the item you are ejecting from your mouth and pass it to the player on your left. That player can choose to accept the spew (and perhaps triggering his own spew) or reject and discard the card. Each item card usually have glory points as well as toughness points. You are trying to be the first to chew and swallow 7 Glory points worth of items. To chew and swallow, you must have chew tokens on the card equals to or exceeding the toughness points. So after you have selected a card, you will now Froth and this means you gain 2 chew tokens to distribute to any of the cards in your mouth but maximum 1 chew token can be placed on each card (unless you have special functions). After you are done, you refill the market and the next player can now take his turn. I keep seeing a sphincter of success ... don't you? The game has really nice art and I love how the player board and the way you are placing items onto the board really feels like you are stuffing your mouth full of items. The items are also oddities from a tapeworm to a box full of spiders that gives you a lot of glory points after swallowing it. Components are also good quality though the chew tokens remind me of medicinal tablets and the pink is a little icky for me. But what about the game and mechanisms? It is a sound design though nothing is necessary new or innovative. You will try to get condiments that provide chains such that when they are swallowed, the swallow actions some of them provide can allow you to add more chew tokens or even swap or hamper your opponents. So while you are trying to get to 7 glory points first, you are also building up a combo in your mouth so as to maximize your actions. Guts of Glory is a race game and if you are efficient enough, you will win. Unfortunately randomness of the card draw will determine how efficient you can be. If during your turn you are always getting a bad draw, then you are at a disadvantage. The cards and special powers do help somewhat but the luck of the draw could kill the game for you. In addition, there seems to be a runaway leader problem. I started off in a lead and with a little bit of luck I had my mouth setup to be able to chain of some combos that will allow me to win. My opponents tried to steal some cards from me but had to also spew some cards my way which I capitalized. They did manage to catch up to me mid game but I pulled off the win relatively easily. My final board and I won! All in all, Guts of Glory feels very cleanly designed and polished and will work as a light filler where friends can laugh at what they have swallowed and make gross faces at each other when they start to spew. There aren't that many real issues with it but I will recommend a try first to see if this game is suitable for you and your group.